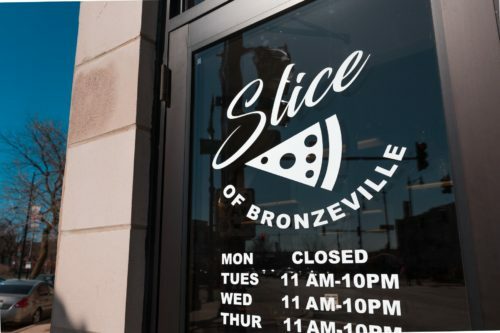 After much anticipation, A Slice of Bronzeville opened two months ago. The restaurant stands at the corner of 47th & King Drive, across from the Harold Washington Cultural Center and Peach’s Restaurant. Its scarce décor, dim lighting, and exposed pipes are reminiscent of “locals-only” coffee shops, but the ever-present smell of tomato sauce and cheese make it clear that we are certainly in a pizzeria.